It happens once a year, and the Canadian Innovation Exchange (CIX) held at MaRS Discovery District did not disappoint. The pitch day serves as a kinder, gentler Dragons’ Den to the ecosystem, allowing some of the best and brightest to speak directly to investors in the room. Nevertheless, the 20 startups invited on stage did face some tough questions from panels of experts assembled. Take Medella Health—a promising startup with a great story. It’s riding the new health wearable wave in the form of a contact lens for diabetics that monitors glucose levels by measuring tear drops. This smart device is possible thanks to the growth in nanotech and micro-electronics technologies which allow entrepreneurs to create sensors so small they can fit into an eye. Harry Gandhi, CEO of Medella Health, pitched his company’s glucose-monitoring contact lens at CIX. But Medella faces a tough hurdle, according to Michelle McBane of MaRS IAF. Weighing in on her panel at CIX at MaRS today, she called Medella the David to Google’s Goliath: “I’m a huge fan of monitoring disease in a non-invasive way, but you have some big players you are going up against.” In her investor-direct approach, McBane challenged CEO Harry Gandhi by asking him how the company can differentiate itself. Gandhi obviously anticipated the question and volunteered that Medella is not only going up against Google but five new competitors that have moved into the space. Gandhi had a quick rejoinder for McBane: Google is stronger on micro-electronics, but we compete on sensors. “Our sensors last 30 days so calibration is simpler and cost is lower because we are not replacing lenses every single day,” he added. So was McBane convinced? Off stage she said Medella’s advantage is in leveraging the competition. “Medella is going to benefit enormously from the buzz created by Google and others leading the way. Their strategy—which is a good one—is to be a fast follower with a better solution for the consumer,” she adds. 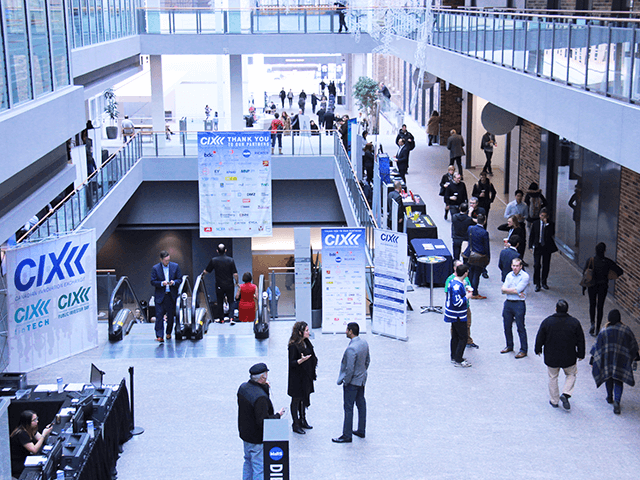 Left: Startups had the chance to mingle with investors at CIX. Right: The Zeitdice smart time-lapse camera was showcased as one of the CIX Top 20 innovations. Also up on stage today with his Teflon armour was Michael Schwanzer, CEO of Zeitdice, a smart time-lapse camera that uses machine-learning applications to curate video content in real time. Zeitdice, another company within the MaRS network, piqued the interest Chis Eben, managing partner of The Working Group. He asked how Zeitdice, an early-stage company, would find the right balance of perfecting two things at once –sophisticated software as well as complicated hardware. “How does an early stage startup find the right path?” asked Eben. Not missing a beat, Schwanzer said his sweet spot is building software that reveals patterns. Creating a camera (the hardware) was a necessary evil—something he had to do to get his software to market—but Zeitdice is first and foremost a software company, and that’s what his marketing team will focus on.